Of the 54 films that screened as part of the 30th Alliance Française French Film Festival, three were exclusively in the English language, and two of these were English-language debuts, each by a luminary of contemporary French cinema. One is Claire Denis’ High Life. The other is Jacques Audiard’s The Sisters Brothers, a spirited Gold Rush-era western adapted from Patrick De Witt’s identically-titled novel. It’s 1851 on the American West Coast and sibling contract killers Eli and Charlie Sisters (John C. Reilly and Joaquin Phoenix respectively) are in search of Hermann Warm (Riz Ahmed), a chemist whose newest invention is the envy of their employer, The Commodore. Even hotter on Warm’s trail is John Morris (Jake Gyllenhaal), a scout whose job it is to ‘deliver’ the prospecting chemist onto the brothers so that they can do what they do best. 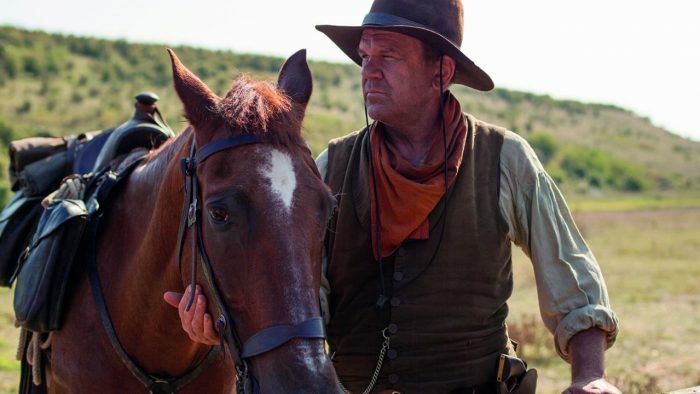 But in the vein of a revisionist western, The Sisters Brothers tosses the volatile duo into a dying ‘wild west’, a changing frontier of new tools, new rules and new ideas. After working as a screenwriter for two decades, Jacques Audiard’s made his directorial debut in 1994 with See How They Fall and has steadily risen to prominence within France and internationally, most notably with crime drama A Prophet (2009) and the Palme d’Or winning Dheepan (2015). With The Sisters Brothers being a centrepiece of this year’s Alliance Française French Film Festival, Audiard was one of this year’s festival guests, and we were able to sit down with him for a lean but candid conversation. I’ve seen The Sisters Brothers and I quite enjoyed it. You recently won a César for Best Director. Congratulations for this, for the Venice win (Silver Lion for Best Director) and for the good reception the film has had. The first question I have is an odd one. This is a French co-production, English-language, ostensibly a western with American leads. If someone was watching this film and they though that it was an American movie with an American director, how would you respond? Yes. Yes, because of the actors. I think that is what’s most important for me. So it’s what defines the movie: the actors. Here they speak English, American English so… it’s an American movie. What about the style of it, because a lot of people have commented that it doesn’t feel like a a typical American film. That, I don’t know. I don’t know exactly, but I don’t think it’s really a western. It’s more like a fable, really. It’s kind of a gothic tale. It was this way in the DeWitt novel. Quite a few directors who don’t make English-language films—French directors, Chilean, Greek—have started making English-language debuts. You’ve got Claire Denis who’s made High Life, which is her first film shot in English. Sometimes it’s treated like a graduation of sorts, that you now get to make one. How do you feel about that? Were you interested in making an English-language film? No. What really interested me is that John C. Reilly gave me the book. It was like an order. But before I got the book, I really had a desire to work with American actor and actresses. The thing with American actors is that there’s a big distinction between being an actor and a comédien. And an actor is really a movie actor, a cinema actor. So they have a very technical, specific knowledge of the work that a screen actor has to do. And when they arrive on set you shoot with that whole energy. In a recent interview you said that Joaquin Phoenix reminded you of a European actor. When John C. Reilly and his producing partner gave you the book, what about it made you want to turn it into a film? What intrigued you the most? I love the book. If I had bought it in France in my local bookshop, I would have read it but I wouldn’t have thought I could make it because it’s a western. But I did the project because it was an American actor who brought the book to me and made that a possibility. Do you think you could have turned it into a non-western? Something else but with the same spirit? Maybe. At the very beginning, I thought about it. It would have been almost like a vampire movie. And so the entire movie would have been shot in the dark, at night, and at the end of the movie you would have the sun rising and it would be like the rise of democracy or something in the wild west. [Laughs] It was a very different movie. And there’s still a part of it in The Sisters Brothers, what I just told you, with the beginning of the movie set in near total darkness. But that’s what is left of that idea. Did you shoot with natural light for the most part? The interiors are very dark as well. Yeah, we did a lot of shooting outside. Benoît Debie (director of photography) did everything digital. He didn’t want to use digital. He usually shoots everything on film. I didn’t necessarily want this film to be shot on film, but maybe I was wrong. What I should have done would be to shoot everything that is at night—inside and outside—on digital, and everything that is outside and with natural light on film. Digital is not great for all these scenes that are shot with natural light. But you don’t regret anything? That’s unfortunate, because the film is now out in the world. [Laughs] You ask me questions, I answer. So you feel that this is not a western? When I worked on it I thought it was more like a fable, and so when I was speaking with my co-writer [Thomas Bidegain], we had—as a reference—The Night of the Hunter. Did you screen it for your crew? No. I wasn’t going to show it to them; they probably all know it by heart. I would have looked like an idiot. You know, “Come to my house and I’ll show you The Night of the Hunter.” They would have thought I was a complete idiot. That’s a very well-known movie. Spain, Romania, and a little part in France. Sergio Leone shot some of his great westerns in Spain. On that note, seeing as you don’t consider this to be strictly a western, do you consider it to be revisionist as opposed to traditional? It’s neither one nor the other. [Sergio Leone’s] westerns are too ironic. I think I’m more earnest that way. I wanted something that was kind of a macabre comedy, because that’s what it was in the novel. It’s the most comedic film of yours I’ve seen. Yes. And that was intentional. The characters of Charlie and Eli remind me of some of your other characters: these men who have a history of criminality or violence but are coming to terms with their humanity, their complexity. Over the years, have your thoughts and feelings regarding masculinity changed? Charlie and Eli, they look like they’re 40-year-old men but you have to consider them as 10-year-old children. So everything that has to do with sexuality will come later, when they’re ‘adults’. For now, they’re masturbating. They’re like teenagers. You look at the film and you see Eli trying to move away from the family history of violence and alcoholism. He’s interested in the new, in the future. And it looks as though he’s helping Eli to overcome some harmful traits. Do you think that Charlie is helping Eli in some positive way? I don’t think so. Charlie’s very immature and that can’t satisfy Eli anymore. And strangely, Eli is the character who’s the least refined-looking, you know, big guy, quite ugly, and yet he’s the one who is the most modern. And he’s the one who will accept modernity more easily. At the end of the film, when they go to their mother’s ranch, what was your intention and approach? The ending really reflects what happens in The Night of the Hunter, when the children go to Lilian Gish’s house. And I cast an actress who looks like her. Yes, Carol Kane. And before going back to their mother’s—in the book, Eli was meant to kill the Commodore. But we didn’t need that [In the film, the Commodore is already dead]. For me, after they cross the river, it’s done. After the river, it’s the end of the killing. As a viewer, if I had seen Eli kill the Commodore it wouldn’t have worked. That’s why Eli punches the Commodore in the face instead. That’s why he punches the dead. When the characters of Hermann Warm and John Morris meet their fate, is this as a pair of idealists who are trying to create a utopia, or a pair of men who are just looking for gold? Warm and Morris, but more Warm, they made these two ideas go together, they can’t be separated. So, the gold represents the utopia, so when they die they’re more like martyrs who will haunt Charlie to the end of his days. I hope. The reason that this happens to them is because of Charlie’s behaviour. What do you think drives him to grab that extra keg of chemical? Is it because he also believes so strongly in this utopia? And yet he’s the one who survives, albeit with one less arm. The most stupid thing is the fact that he’s a child so he doesn’t understand consequences. Were there any particular contemporary issues that you were thinking about when you were writing the film and during other parts of production? Anything pertinent to today that you were trying to explore? That’s not what we were thinking, like, “Hey, let’s put some contemporary issues in here.” In the book, both Warm and Morris were very caricatured. And there wasn’t the idea of utopia. That’s a very European idea: [Henri] Saint-Simon and other utopists. In 1848, you have The Communist Manifesto that precedes all these left wing ideas. And so there’s big communities of these kinds of people with these types of ideas who went to America, and they were killed by sickness, by warring with Native Americans, or just greed. And I think, now, the only ones that are left are the religious communities, like the Amish for example. You were talking about shooting on digital, and I was talking about Eli who’s interested in toothbrushes and toilets that flush; the new, the modern. Was the decision to shoot digitally artistic or logistic? I know it was not very smart, but it was my idea. My last movie shot on Film was Un Prophète (A Prophet), and after that I got lots and lots of propositions and I decided to go digital because I’m not really fetishist about film in general. But it would have been better to mix the two for this film. I wasn’t aware that A Prophet was the last picture you shot on film. Nowadays, shooting on film is a lot more costly. With Rust and Bone and Dheepan was it also a matter of choice? For those I made the same mistake. I’m learning very slowly. For Rust and Bone I should have shot all the exteriors on film. As soon as there’s sun, digital is crap. Most of your films seem to end with redemption, apart from, perhaps, A Prophet. Your films seem to end on a note of optimism. Do you consider yourself an optimist? It’s difficult. I’ll talk about myself as a viewer. I don’t like tragic endings. It’s too easy to rely on fate. But because I’m the writer of my films, I really want that kind of ending. So I change life. Do you think A Prophet has a tragic ending? No, no. There’s sort of an irony in that ending. With Tahar Rahim’s character, it’s really a happy ending. Even though he’s still a bad guy, he will still raise the child of his friend. He will be a good father. He’s a virtuous bad guy. He doesn’t like violence. And the people he’s met who have that power, that violent power, he judges them, in a way, and thinks they’re idiots. While we’re on the topic of endings, did you conceive the ending of Dheepan as being something of a dream, or a fantasy? It reminds me a little of the ending of Taxi Driver. De Niro’s character loses consciousness and then he’s back driving a taxi, he’s a hero, and he picks up Cybil Shepherd’s character who looks somewhat impressed. Some people suggest that this is a dying man’s fantasy. And in your film, Dheepan and his family move to London. But the way it’s structured, it cuts directly from the bloodbath to this idyllic scene in London. Why did you make the decision to shoot in India? I didn’t want it to be realistic. Not completely realistic. So when we shot the movie, there were a lot of migrants coming to France, in Calais, what they call “The Jungle”. Where did they want to go? They didn’t want to stay in France. They wanted to go to England. Why England and not France, do you think? Well, you’d have to ask them. A lot of streaming services have been courting great filmmakers – Bong Joon-Ho, Scorsese etcetera – perhaps with the promise of resources and a wide reach. What do you think about filmmakers moving towards this model? Was Alfonso Cuarón’s Roma right to be produced by Netflix? I don’t know. I mean, I know he knows. But you can see with the Netflix production that something feels very different. I don’t like Netflix. I don’t use it. But when I look at the Netflix page, I feel like I’m in a supermarket. I’m not joking. I can’t bring myself to watch these movies. Not in that sort of environment. But the fact that Cuarón managed to make them do this movie which is an auteur movie really, he in a way fucked them. And it’s a good thing—well done. It’s like he went to a bank and did a hold up over there. That’s the way it should be done. What are your thoughts and feelings regarding the French film industry at the moment? What are the main challenges that you think are facing filmmakers in France? Today, more than yesterday, I’m very pessimistic. Today, we talk about films and movies because it’s easy; it’s an easy topic of conversation. But I believe that cinema, as such, has disappeared. It’s not the same any more. And from the 1990s there was this move to digital and that’s when there was a real rupture, a real change. I don’t think we really understood that. That cinema doesn’t really need reality in order to exist anymore. If you shoot on film and you want an image like that [the Sydney skyline], you have to do all the things, like with the lighting and everything. You need to have a certain sensibility to do that. With digital you just take that landscape and add something else. You add the characters or you invent them. And when you show it in a theatre, unless you’re a professional, you won’t know that it’s not a “real” image. There’s something that’s really changed. Are there any filmmakers that excite you? I hear that you’re a fan of the film Sophia Antipolis. Yes, yes! Virgil Vernier. He made a movie before that I really liked called Mercuriales. It’s really beautiful. I also like what Pierre Salvadori did. It’s a movie called En liberté! [aka The Trouble With You]. Justine Triet, who is a female filmmaker. She’s also great. In what language will you be shooting your next film? American English and Mexican Spanish. I’ve already started so I hope it will be ready by the end of next year. Do you have a title for it? At the moment it’s called Emilia Perez. It’s the story of a drug dealer who is trying to disguise himself as a woman to escape everything. Sounds a little like Some Like it Hot. Well, it will be a musical. [Smiles] There will be a lot done in the studio and it might be shot digitally. But I’ll think about it. Will it star John C. Reilly? No, this time we don’t know the actors at all. There will be singing. Well, I look forward to it. It’s been a pleasure talking to you. * Sophia Antipolis (dir. Virgil Vernier) and The Trouble With You (dir. Pierre Salvadori) are both featured in this year’s Alliance Française French Film Festival lineup.